The story of P-Square began in St. Murumba College, a small Catholic school in Jos, Nigeria. Identical twins Peter and Paul joined their school's... music and drama club where they began singing, dancing, and miming songs by MC Hammer, Bobby Brown and Michael Jackson. They later formed an acappella quartet called MMPP (Michael, Melvin, Peter and Paul). Drawing inspiration from their music idol Michael Jackson, they began break dancing, and formed the group called "Smooth Criminals" in 1997. Their artistic talent and precise dance routine soon made them household names in the city of Jos, where they performed at school functions and other occasions. Later in 1999, Peter and Paul returned to music school to develop their skills on keyboard, drums, bass and rhythm guitar. Their work includes the soundtracks for films like Tobi, Mama Sunday, Moment of Bitterness, Evas River. Academic pursuits led them to the University of Abuja later that year, where they were admitted to read Business Administration. The Smooth Criminals disbanded when its members were dispersed to northern universities in Nigeria. Subsequently Peter and Paul formed their own group, variously called "Double P", "P&P", and "Da Pees", until they eventually settled on "P Square". In 2001, P Square won the "Grab Da Mic" competition, hence Benson & Hedges sponsored their debut album, titled "Last Nite", which was released under Timbuk2 Music Label. They are managed by Bayo Odusami popularly known as Howie T, a seasoned concert promoter and the CEO of Adrot Nigeria Limited. P Square was nominated as "Most Promising African Group" in the Kora Awards three months after the release of their debut album. They eventually won the 2003 Amen Award for Best R&B Group. P Square has now released their second album, "Get Squared" under their own label, Square Records. This album is marketed nationwide by TJoe Enterprises, although they are still managed by Howie T of Adrot Nigeria Limited. The video for the second album, "Get Squared", held the #1 position on the MTV Base chart for four straight weeks. They have an ever growing fan base across South Africa with a particular stronghold of die-hard fans in Cape Town. Audi station wagon sales numbers have rocketed in Cape Town since one featured in the band's latest video. Compass enetertainment's Hazeez Balogun recently caught up with the duo before one of their stunning performances in Makurdi, Benue State. Music, they said, is not their first and major talent. One would have been stunned to see Peter and Paul kicking football, but that was exactly how it started for them. 'We were supposed to be footballers. We used to play football. Paul was a goalkeeper. We were in the same team with Mikel Obi. Football was our back up. We don't play football anymore, if we play football, we can't dance as easily as we dance because of injuries and all that'. When the group started gaining recognition, they were heavily criticised for singing other people's songs or better still interpolating tunes and beats. To date there are still some who will claim they can prove that all P-Square's songs include bites from other people's songs. However the truth is that taking samples from other's music is normal and not a rare occurrence in the music industry according to Peter, those days are over. Despite the closeness and the natural chemistry; as they themselves have said in one of their songs “Peter and Paul we be one no be two”. They will eventually grow up have a family of their own. Some months ago, they celebrated a talk of the town 28 years birthday. Peter as it has become public knowledge is in a serious relationship, while Paul though still denies it is said to be having a secret affair. Whatever the case may be, they are both fast reaching that point in a man's life where a decision must be made. With a horde of girls out there ready to trade an arm to be with P-Square, will these two make the decision to marry soon? 'no o, we don't even see that happening in ten years time. I am only joking sha but the truth is that marriage is not the next thing on our agenda now, we still have a lot to achieve', Paul says. Even when they eventually get married won't that break up their brotherhood? Well the two seem to have it all worked out. 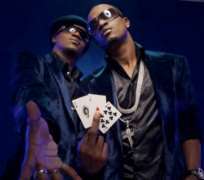 They sure do agree that marriage will bring a lot discomfort to the musical group P-Square as it will bring some kind of divided attention. 'We may have to be at the airport, one of us might say his wife is sick, or he has to see his son, and stuffs like that. It may definitely bring a lot of misunderstanding. That's why we're not thinking about it right now'. So is their relationship water-tight? 'We're not God, we can not predict' even if there's going to be anything, it's going to be an understanding, we're equal partners and we're twin brothers. 'We argue, we fight, but it makes us better. Arguments bring better songs, better videos. We are humans. I remember when we were recording 'Get Squared' we quarrelled for over three months. We were living in the same house, and we didn't talk. I didn't like 'Bizzy Body,' Paul didn't like 'Get Squared.' And those two songs blew us up. Do these young stars still have childhood memories?There was this particular rock behind our house, we would climb the rock, sing and disturb everyone. Then a woman used to sell "akara," we would buy from her...we were doing that because someone said if we wanted to sing, you have to climb a very high place and sing so people can know you can sing.